Viking's Race. While Bolero seems to be unstoppable, the rest of the fleet has been having fun battling for second. In the first four races it's been Sleepyhead, Dogstar, Dogstar, and Viking. Here's the "press release" on Viking's race. Dateline Treasure Island: In an impressive display of sailing acumen and speed, Mike Borgerding and crew drove Viking to a well earned second place in the second race off Treasure Island on May 20. Cagily starting at the pin end of an incredibly skewed start line, Viking, under only working sails in 20 knots of wind, jumped to a huge lead. Mike & Co. led the fleet on most of the first beat to weather, finally being passed only by Bolero. 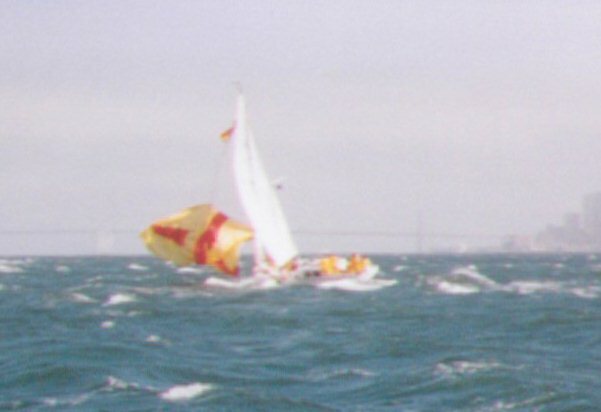 Viking maintained a narrow lead over Sleepyhead on the downwind legs and a huge lead over Dogstar which was experimenting with it's own brand of strategy. Two perfect tacks and Viking crossed the line right at the committee boat a few seconds ahead of Sleepyhead and a minute and a half ahead of Dogstar. So where in the world is Alex Chang? His last apperance in this newsletter was related to the photo, below, of Hulakai. 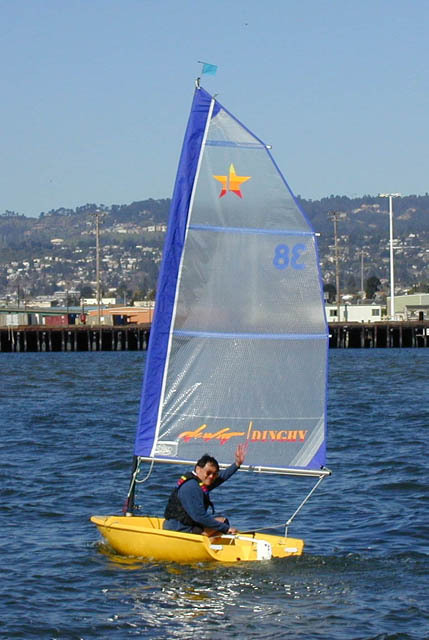 These days one of Alex's more pleasurable buisiness ventures is his involvement in DeWitt dinghys (http://www.dewittsailboats.com ) . We ran into Alex late last March showing-off his babys on the Estuary. No headsails to change.... or explode. Ahhh.